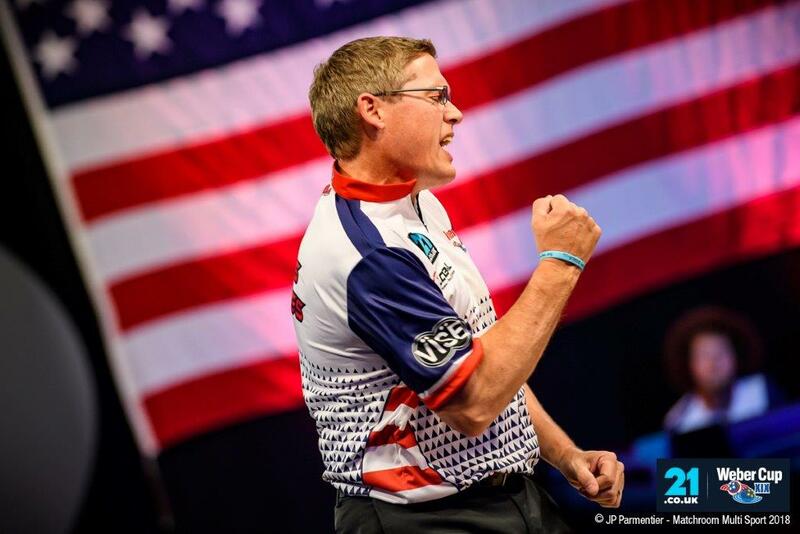 TEAM USA, featuring come-backing veterans Tommy Jones and Chris Barnes, enjoyed an outstanding opening session at the 19th annual 21.co.uk WEBER CUP as they won five of the seven matches to carry a three-point lead into day two of the annual transatlantic tenpin tussle. Europe were fielding the same team that won in 2017 which was their fifth Weber victory in succession, and they got off to a fine start, winning the opening Baker formatted match. Afro-haired Kyle Troup fired back in the second beating Euro skipper Dom Barrett by a 12-pin margin. Debutant Anthony Simonsen won another close match over Jesper Svensson before two sub-200 games by Martin Larsen and Stuart Williams respectively allowed Chris Barnes and then Tommy Jones to win comfortable points. That pushed the USA in a 4-1 lead and there was more in the next as Jones got the better of Barrett to leave Europe in a perilous position. The final match of the session was a ‘Fans’ Vote’ match that saw Weber Cup followers voting via social media platforms for the player from each side that they wanted to see in the final match-up. It was Svensson and Troup who carried the vote and they contested a close-scoring match. In the end, it was the Swede who nicked the point by a single pin and that turned a potential 6-1 deficit into a slightly more bearable 5-2. Chris Barnes, captaining the side in his appearance since 2014, said; “The opening session went as well as we could have hoped, especially after the dismal Baker game start. We got off to a poor start and you know Jesper is coming through, he has always been a really tough guy to beat here but Kyle beating Dom in the second match was a huge part of our success today. “Tommy has historically been as good as anybody on this lane for longer than anybody on this lane so that’s why we sent him out back-to-back. He is our go-to guy and he came up big for us. Two wins got us 5-1 up with a free swing at knocking Jesper off twice in one night. Despite being three points behind, Dom Barrett was upbeat; “The mood is actually pretty good. We know Jesper is good and winning that last match is big for him. The rest of us need to find a way to strike more, to compete more, and follow on from there. “We have had a couple of ball reaction issues on the lane, we had it a couple of years ago too, and we rectified it. Stu recognised straight away it’s the same problem but hopefully we can figure it out and pick a pattern that can help us tomorrow. Finally, Kyle Troup summed up his thoughts after a bright start, “It was a very good start for Team USA, we wanted a big start and 5-2 is definitely a good start but we know it is one session at a time – we had the lead last year and you saw how that went. Play continues tomorrow at 12.30 with three doubles and four singles matches.